In early 2003, leadership author John C. Maxwell fulfilled what he described as a lifelong dream: he spent a few hours in Los Angeles with the man he considered his mentor, legendary basketball coach John Wooden. On the occasion of his graduation from elementary school, young John Wooden received a piece of paper from his father, Joshua. On one side his father had copied a short verse, later summed up by his son in these few words: “Think clearly, have love in your heart, be honest, and trust in God.” On the other side he had handwritten a list of “Seven Things to Do.” As he handed the paper to the boy, he said only, “Son, try and live up to these things.” The paper remained in the young man’s possession until it was tattered, at which point he transferred its contents to a card. 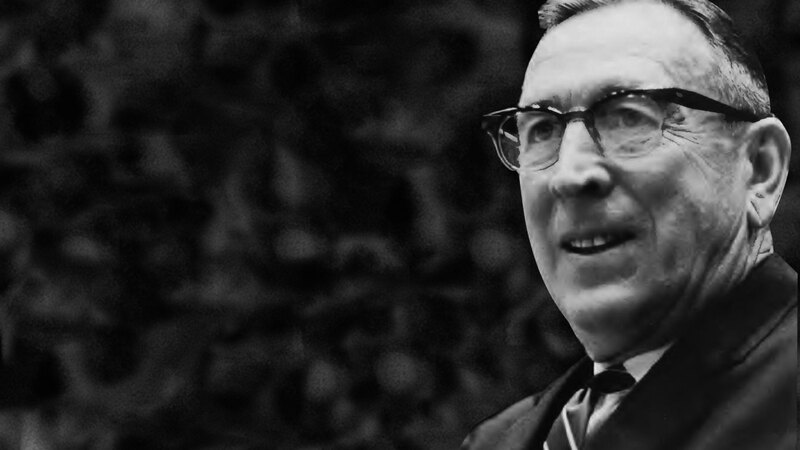 A masterpiece is something that’s done with extraordinary skill, and a review of John Robert Wooden’s life journey suggests that this maxim was indeed a daily focus. Born in the small town of Hall, Indiana, on October 14, 1910, Wooden was fascinated with basketball from a young age. He was a superb player with the skills to lead his high school team to three consecutive appearances in the state championship finals, and his college team, the Boilermakers of Purdue University, to a 1932 national championship. His ability to bounce right back up from dives on the court earned him the nickname “the Indiana Rubber Man.” According to his official Web site, Wooden was “one of only two men enshrined in the Hall of Fame as both a player and as a coach.” An equally remarkable achievement was his Big Ten Award for Proficiency in Scholarship and Athletics. After graduation from Purdue, Wooden played professional basketball and also coached and taught at a number of schools in the American Midwest. He had met his wife, Nellie, at a local carnival in 1926. They began their married life in a small ceremony in 1932 and were together until Nellie’s death in March 1985, following a long illness. The Wooden family would grow and endure a succession of coaching positions at several colleges and universities. However, it was his tenure at the University of California–Los Angeles (UCLA), as head coach of the Bruins from 1948 until his retirement in 1975, that secured his status as one of the greatest coaches of the game. Under the guiding hand of Coach Wooden, the Bruins became an almost unbeatable force in college basketball. What separated him from most other coaches was not just his emphasis on top physical conditioning; he also demanded high character and values on and off the court. This relentless and persistent focus led to an extraordinary record that remains unmatched. Marques Johnson, a key player during the last years of Wooden’s tenure, remembers being awed by the record and the legacy in the making: “I couldn’t really sit down and have a conversation with him about real things just because I had so much reverence for him—for who he was and what he had accomplished.” Not that Wooden wanted to be treated that way; it was simply the feeling he engendered. John Wooden was 99 when he died. He impressed his former players, admirers, and those who felt mentored by him with his humble enthusiasm and zeal for life. What was more impressive, however, was his unnatural ability to look beyond a game or a term paper toward the development of personal character and integrity. In effect, John Wooden was looking over his life to examine whether he was living up to the standard passed on to him by his father years before. “Make each day your masterpiece.” In many ways, the famed “Wizard of Westwood” led his life in the only way he knew how: as a work done with extraordinary skill. John Wooden with Steve Jamison, Wooden: A Lifetime of Observations and Reflections On and Off the Court (1997). John Wooden and Steve Jamison, The Wisdom of Wooden: A Century of Family, Faith, and Friends (2010). John Wooden with Jack Tobin, They Call Me Coach (2004). “The Official Site of Coach John Wooden,” (2010).